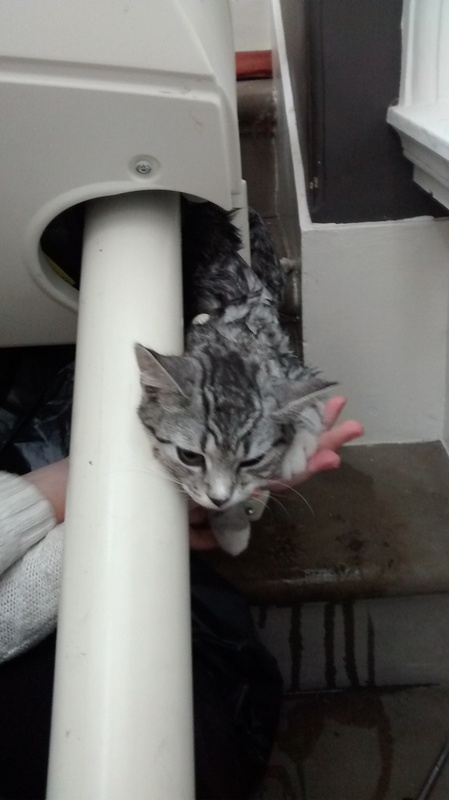 A cat had a lucky escape after getting stuck in her owner’s stairlift. The grey tabby cat named Maggie May got herself wedged between the stairlift and the rail support at her home in Helsington, Kendal. The young cat’s worried owner called a local vet and the RSPCA to help free the kitty. The vet had tried to ease the cat out – who was stuck by her stomach and back legs – and sedated her so she wouldn’t get any more stressed. RSPCA inspector Chris Towler arrived and an engineer was also called to help try to take the stairlift apart and rescue the puss. “The cat had followed her owner down the stairs when she got caught under the lift,” inspector Towler says. “The engineer loosened the post from the rail but was unable to move the chair off of the cat as the floor bolts were covered by the seat. Inspector Towler used a jack from his van to push against the rail and adjacent wall. This provided the gap needed so the cat could be slid free.